The law says that companies disposing of waste into landfill sites must have a permit. The permit requires them to monitor various things, so that we understand what impact the site may be having on the environment. The list of things they have to monitor is quite long, but might include things like measuring landfill gas emissions, or taking groundwater samples to find out if any polluting substances are coming from the landfill. Waste companies carry out the monitoring they’re required to by each site’s permit, and periodically report the data they collect to the Environment Agency (one of Defra's delivery bodies). To date, there’s been no standard way of submitting the data to the Environment Agency - usually it’s sent by email, and sometimes on paper through the post. And there’s no central database to store all the data in, which means we’re not making the best use of it. At the same time, there has been no standard way to check data against the limits set in the permit. Assessing that data is a relatively slow manual process. Computers are much better at checking a lot of numbers than humans are. Work began on a central database some years ago. A number of landfill sites have been taking part in a trial that made use of a database called EMMA (Emissions Monitoring Management and Assessment). More recently, a team based in the Environment Agency's Bristol office has been working on a data returns platform that makes it easier for anyone to submit data. That platform means landfill operators can submit their data online. That data is transferred to EMMA, which automatically assesses it against permit limits. 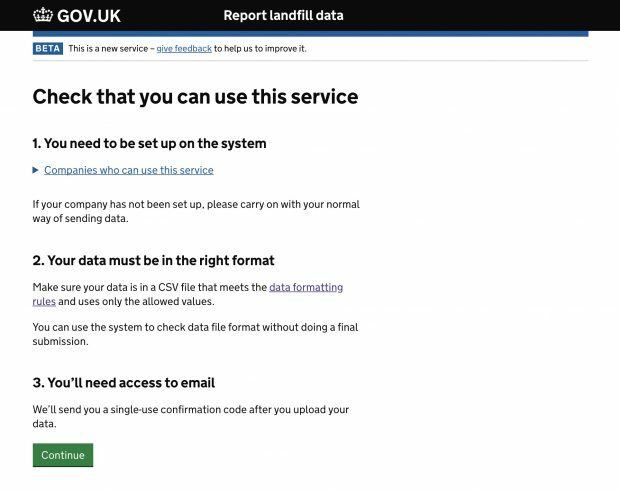 The new service includes a detailed page of data formatting guidance to help landfill operators prepare their data in the right way. That’s because it introduces a new standardised format that might differ from formats they’ve used in the past. We’re working with operators to try and make it as easy as possible to make the transition. We’re keen to get feedback from people in the trade. If you’re reading this and you have some comments about the public beta, you can send them directly to the team using the built-in feedback form. Remember the data returns platform that the new service depends on? It has a built-in data validation feature, capable of checking incoming data for errors. For example, if there’s a field asking for “volume of fluid” and the given answer uses the wrong units, it will display an alert asking the user to double-check. It even tells them exactly whereabouts in the dataset the error is, to save them more time. This instant quality check is a big step forward, which means both government and permit holders can be confident that the data being returned is useful and accurate. And because it’s been designed and built as a platform, it can be used for other things. There are other sectors that submit data to the Environment Agency, so it can be used again as other services are developed. This is just one of a series of services under development in Bristol. Teams there build digital services that help us better regulate companies and people who hold, or are applying for, licences and permits to do things that take place in, or affect, the natural environment. Issuing and managing these licences and permits is a large part of why Defra exists. More services like this are on the way, dealing with things like waste management, or using water taken from natural water sources. The team have done terrific work to get this service to public beta, working in agile ways, putting user needs first, and iterating one step at a time. There's more to come from the Bristol teams (some of it quite soon), and more to come from other teams across the Defra group. We'll tell you those stories as soon as we can.